Don't laugh at or ignore Amazon's new home virtual assistant appliance. Devices like this will soon be as common as toasters. Echo is closer to how we'll use computers in the future because it's optimized for hands-free, ambient use. It's optimized in the sense that Echo has a purpose-built microphone designed to understand human speech anywhere in a room and a speaker system that enables human ears to hear the response -- as well as music and other audio -- from anywhere in a room. (In fact, the device is almost entirely made up of speaker components.) A ring around the top lets you adjust the volume of the speaker. And a light lets you know when it's working. Unlike smartphones, Echo is not designed to just make it possible for a specific person to instantly access a virtual assistant; it's designed for use by anyone in a room. Star Trek nailed it. In that series (in addition to an absurd array of dials, buttons and screens), the main interface to the Enterprise's supercomputer was voice. A crew member would say: "Computer" followed by some command or question. The computer would talk back. It's inevitable that this interface will be extremely effective, appealing and ubiquitous in the future. We'll talk, and the virtual assistant of our choice will answer, act and respond accordingly. As artificial intelligence, voice recognition, speech recognition and other technologies related to virtual assistants improve, these interfaces will do amazing things for us. They'll understand, interpret and make decisions based on past behavior. We'll blurt out "Alexa" or "Hey Siri" or "OK, Google Now" or "Yo, Cortana" followed by something cryptic and colloquial: "We need paper towels!" The assistant will know your preferences and will have access to your credit card, so it will go ahead and order the paper towels and have them shipped. It's not hard to see why this is important to Amazon. It appears from our limited perspective that Siri, Google Now and Cortana operate on general-purpose devices, while Echo is a limited-purpose device. But conceptually, the opposite is true. The future of virtual assistants isn't mobile devices and PCs, but microphone-speaker-Internet-connection devices that are custom- or purpose-built for exactly whatever space you're in. I think it's a near certainty that there will be Echo-like devices for living rooms, bedrooms, kitchens and garages. Plus smaller and quieter ones for the bathroom (Oh, shut up: You already bring your smartphone into the bathroom -- what's the difference? ), hallway, car, boat, office and anywhere else you spend time. Of course, if you're jogging or shopping or having a picnic, you'll have to resort to accessing your personal assistant the old-fashioned way: Through your smartphone. But the ultimate result will be that you'll forget about Echo-like products, and you'll simply speak up, address your virtual assistant, and stuff will happen. I believe ubiquity is the core attribute of the voice interface of tomorrow. If multiple devices pick up your voice, which they will, the software will figure out which device to interact with you on. 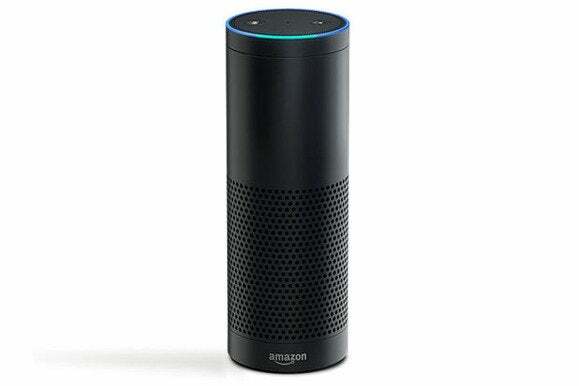 Echo's technology is not more advanced than the hardware facilitating interaction with Siri, Google Now and Cortana. But the use case, the approach, the scenario is more advanced. In the future, virtual assistant hardware will be optimized for the space or location. I also believe hundreds or thousands of companies will make that hardware. Sonos should and probably will start soon building microphones into its speakers. Refrigerators, lamps, tables and other ordinary household objects will get speakers and microphones and Internet connections for this purpose. Cars already have the microphones and speakers and will soon universally support the option for Internet connectivity. That's why Echo, while itself a single-purpose device, represents a use case that will be handled in the future by any device. Anything with a microphone, speaker and Internet connection will function like Echo. The criticism of Echo is a knee-jerk reaction that's perfectly futile. This world is absolutely going to happen. And we're going to love our virtual assistants, because they'll protect us, help us and make our lives much easier. Yes, of course we don't want to be tracked -- or be trackable. The idea of computers listening to us in our homes is creepy. It's all in the service of exploitive commercialism. It feels dystopian. But it's also true that it's going to happen. We're going to love it. And people born from today onward won't know any other way.